Gracious, friendly service, maximum comfort and total safety. That’s what – by EMKA-Trans’s standards – luxury passenger transport shall be. 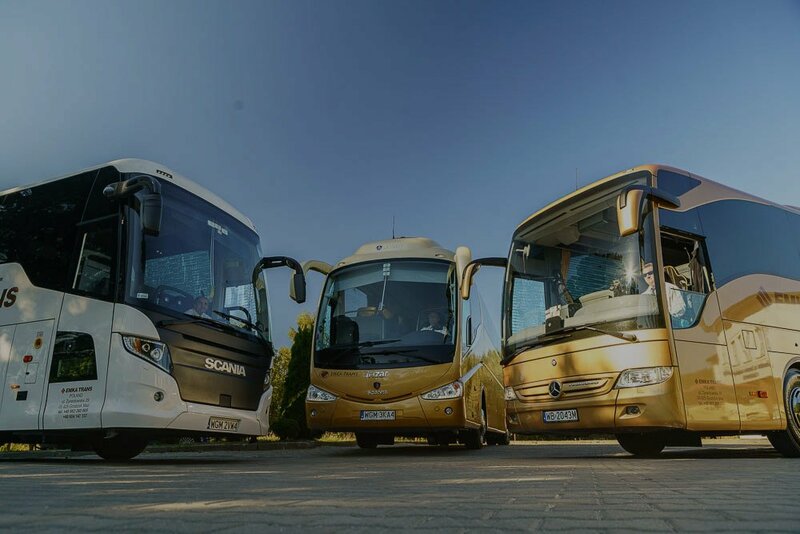 And that’s the passenger transport EMKA-Trans offers to our clients without compromise.Our luxury coaches make traveling a pure pleasure. But luxuries coaches is not all that you get from EMKA-Trans. From us you get the whole package. 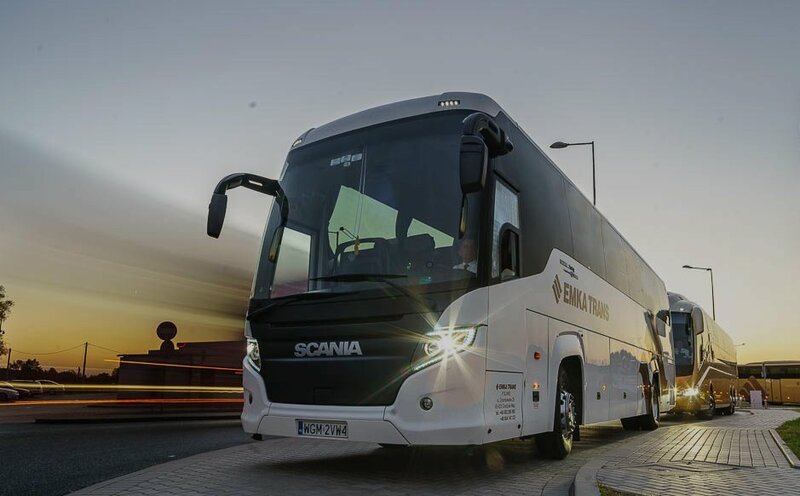 Ourexclusive new Mercedes and Scania coaches come with courteous, experienced, competent, and English proficient drivers, who move the vehicles perfectly and safely along the crowded city streets and throughout all countries in Europe. More than 2 million passengers have travelled aboard our coaches to date. Whatever the event and destination may be we will deliver you comfortably, safely and in accordance with the itinerary. Our service is available year round in Western and Central and Eastern Europe, Scandinavia and domestically in Poland. What’s important for you is paramount for us. For EMKA Transcoach rental means more than providing a vehicle with a driver. We pride ourselves in meeting and exceeding your needs. 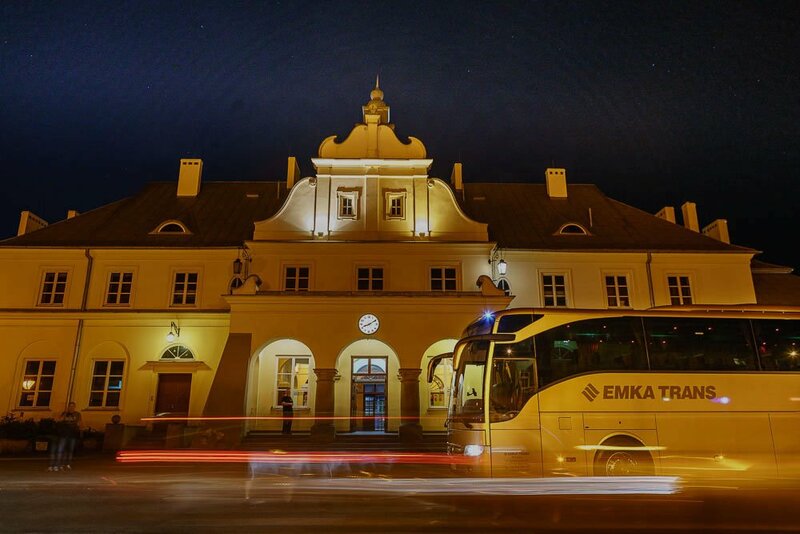 EMKA-Trans will organize and deliver the entirepassenger from A to Z and to a “t” in accordance with your itinerary. We can also prepare and execute a sightseeing program. We cordially invite you to acquaint yourself with our One-Day-Tour offer.We can pick up your group from any place in Europe and in Poland. The travel and transport will be organized in a comprehensive manner, inclusive of additional attractions while in route. We provide services domestically in Poland and to foreign customers throughout various countries. Our drivers are backed 24/7 by competent and English speaking back office personnel, who are happy to attend to your questions and requests. We propose a variety of coach sizes from 49 upwards to 69 passenger seats. If requested, we can also provide coaches or buses for smaller groups. Our vehicles are our pride. Luxury equipment – including air conditioning, WiFi on request and DVD offer comfort even during long hours of travel. Our drivers are diligent and watchful of your needs, comfort and safety, whichmake your travel easy and pleasant. we simply want the best for you. We provide our services to tour operators, travel agencies, congresses, conferences, firms, functions, skiing trips, etc. in Poland and Europe. We hold Community license No OU-000370 to offer gainful international passenger carriage services. Our fleet includes only new (2013- 2016) coaches supplied by MERCEDES and SCANIA. They offer 49, 51 or 69 seats and are fitted with: air-conditioning, DVD, CD, WC, mini-bar, refrigerator, comfortable seats with safety belts, professional sound system, WI-FI at the customer’s request. Apart from high class coaches we guarantee services at the highest level – experiences, courteous, English-speaking drivers familiar with the routes in Europe (including Scandinavia). Our priority is ensuring a high level of knowledge and skills of our personnel and constant improvement of their qualifications. Our priority is ensuring a high level of knowledge and skills of our personnel and constant improvement of their qualifications.Thanks to our professionalism and experience gained over many years of providing transport services we have gained the trust of customers not only from Poland, but also from the rest of Europe as well as from Asia and America. In order to ensure that the standard of our services, comfort and safety of passengers increases all the time, we invest in state-of-the-art vehicles adding several coaches to our fleet every year.